How Can Employees Benefit From A Public Speaker? Home > How Can Employees Benefit From A Motivational Public Speaker? How Can Employees Benefit From A Motivational Public Speaker? Motivation is a key component in our everyday lives – it drives us, it influences us and keeps us going. Without it, we wouldn’t be able to accomplish what we want to do in life, we wouldn’t have goals to look forward to and we wouldn’t be satisfied. With that said, it’s no different in the business world as employees need motivation so they can stay focused and driven to reach goals, which results in a successful and thriving business. This is where a motivational public speaker can help renew and reenergize your company and employees. At any rate, international public speaker, Lawrence Mitchell, has shared the top resulting benefits when you hire a public speaker. One of the key reasons you should hire a motivational public speaker is to give your workers a new perspective, enthuse them and boost overall morale. Employees (and just about everyone in general) have an internal desire to hear that they are doing a great job and that their time and effort is valued. With that in mind, sometimes an inspirational speech is all that’s needed to enhance positivity and productivity. Did you know your employees can learn new skills and knowledge from listening to a public speaker? This is another significant reason as to why a motivational public speaker is beneficial because they can provide employees with profound insight that can contribute to the workplace. Public speakers have the ability to make your employees feel as though they are a part of a big family that relies on one another. This is definitely a feeling that you want resonating through your entire company because it’ll reduce turnover rates and truly make each employee feel happy to work at the company. 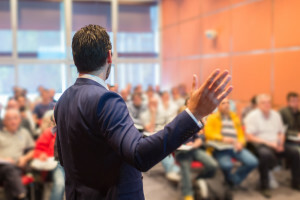 Whether your company is going through some tough times or everything seems to have plateaued, a public speaker can stir up confidence within all your employees. They have the ability to pair their personal experiences with inspirational points to convey that your employees can find their confidence in uncertain times. Motivational public speakers can give your business and employees the competitive edge and push to succeed. Consider hosting a company wide meeting to boost employee morale and to get your work back on track!